It started at the Mac Bar at CYC over a year ago. A casual conversation over an adult beverage with William McGuinn (co-owner of Sail Monkey a local Beneteau First 36.7). We got to talking about 'bucket lists' and races to do before 'rounding the last windward mark' and heading to the big pearly harbor in the sky. The topic of conversation turned to the Transpac (TP) and other long distance races. Bill had done the MAC several times and has his share of stories from that landmark race. Like many sailors- he wanted to cross an ocean some day. The TP is a trans oceanic race that begins in Los Angeles crosses the Pacific Ocean enroute to its finish in beautiful Honolulu, Hawaii. As one of the two oldest trans oceanic races dating back to 1906. The Transpac has a rich history and tradition. Despite the fact that the race can take over 23 days (longest elapsed time) or as little as 6 days: 16 hours and 4 seconds (Held by Morning Glory), Bill expressed that it was a dream of his to do the TP some day. As the night ensued, we talked about what skills he might need to work on to prepare and what the best avenue might be to do it. We talked about West Coast sailing schools that might offer good 'off season' training for a midwesterner. That was it. The seed was planted. I see Bill alot in the off season as we are within a shout of each other for Bear's games, we talk a little sailing, but had not broached the subject of the TP since that night. He had shared that he'd gone out to take a sailing class in the offseason, but we never made the connection or correlated it to the TP. It wasn't until a phone call earlier in the year when he said he was skipping the MAC to do the race. I thought- "Way to go Bill!" You see, we come in contact with many sailors of different backgrounds and skill levels. Many talk about their goals, dreams and ambitions- but seldom is there follow-through. What I like about Bill's story as that he did it. He's out there doing the TP. We look forward to him sharing his experiences with us and the stories of the first sight he has of Big Diamond Head- the legendary volcano that looks over Alai Wai harbor and inlet and the most memorable part of the TP. 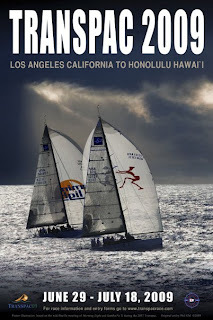 In addition to Bill, two other First 36.7 racers are doing the 2009 Transpac. Click here For live Satellite Tracking. This week's Picture is indicative of the 'feast or famine' Spring weather we've had so far. It has either been raining every other day or hotter than blazes. 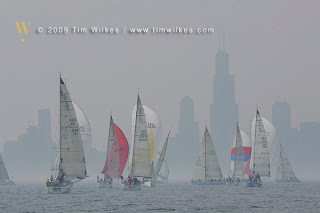 The recent Chicago NOOD regatta (held June 19-21 at Chicago Yacht Club) was no different. The weather went from Storms,Rain with wind on Friday to hot burn, light weather on Sunday. The photo above (courtesy of Sailing World and Tim Wilkes photography) was taken of the First 36.7 Fleet going down to the leeward mark during the regatta. The HOT weather on land is visualized the by ozone haze shielding the skyline. Hoping that our Summer (now officially here) is kinder to us and brings favorable breezes. 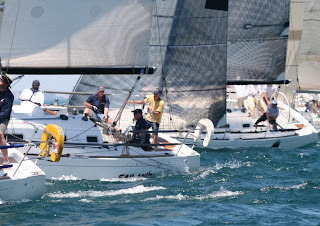 Over Twenty-five Beneteaus will compete in the 2009 National Offshore One-Design (NOOD) Regatta to be held this weekend (June 19-21) at Chicago Yacht Club. This years fleet of over 180 boats will spend the weekend competing for their individual section titles. The Beneteau First 36.7 fleet will be well represented (15 boats) as will the First 40.7 fleet (12 boats). While one of the 'benefits of sailing' is getting away from the entrapments of everyday life, in certain situations you may still need access to some of those entrapments such as your low wattage electronics. To accomplish this you can outfit your boat with a big (and heavy inverter) which is good for long distance cruising, if weight is an issue or if your use of the inverter is more sporadic- it is a bit of overkill. One solution that we've used on 'Karma' in racing the MAC is using a low wattage plug in inverter which converts DC power to AC power. 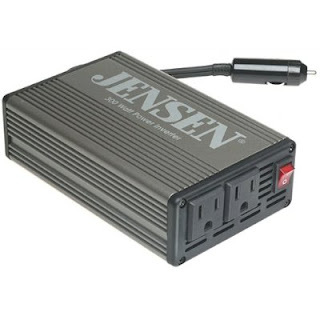 Enclosed is a real simple one that has the capacity for 300W (sufficient to run a pc and other low wattage items) through a 12V DC outlet on your boat. If you secure this someplace on the cabinetry with double face velcro it will work just fine. It will allow you to power your pc off the boat batteries during long range trips (i.e the MAC). It is a real inexpensive solution, lightweight and can easily be stored when not in use on or off the boat. It’s available via online and big box retailers such as Amazon or most electronics stores. July 1st Declared "National Boating Day"
For Anyone that owns a boat, we clearly know what it signifies. It's not just a material possession- it is a lifestyle. For us sailors- the satisfaction is even sweeter. In a year as tough as our country has seen and with all the worries in our land-based lives, our boats continue to be the escapes we need from reality. The Solace that we deserve. July 1st was declared National Boating Day. Just in time for the 4th of July holiday- We ask that you take time to enjoy your family and friends aboard your boat. Create memories that will last a lifetime, unplug from the hustle and bustle of everyday life. Have fun and boat safely. The House of Representatives swiftly passed House Resolution 410 yesterday evening, designating July 1, 2009 as "National Boating Day". The NMMA said in a statement that it will recognise "the important role recreational boating and the boating industry" play in the lives of 59 million American boaters. House Resolution 410 was introduced by Congressmen Ron Klein (D-Fla) and Henry Brown (R-SC), along with Congressional Boating Caucus Co-Chairs Candice Miller (R-Mich) and Gene Taylor (D-Miss) and passed with 27 bipartisan co-sponsors. It must now move through the Senate before the President can issue a national proclamation in observance of the day. This resolution affirms Congress' commitment to the US recreational boating industry and the importance of spending time on the water with family for so many Americans," said NMMA president Thom Dammrich in a statement. This week's picture of the week comes from the 2008 Rolex Farr 40 World Championship held in Miami, Florida. It falls in the category of "How did they do that?". We're sure there was a wetsuit involved somehow. Enjoy! 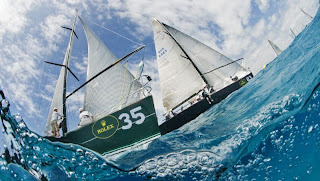 Sidenote: This year's Rolex Farr 40 World Championship will be held in Porto Cervo, Sardinia, ITA June 24 - 27, 2009.